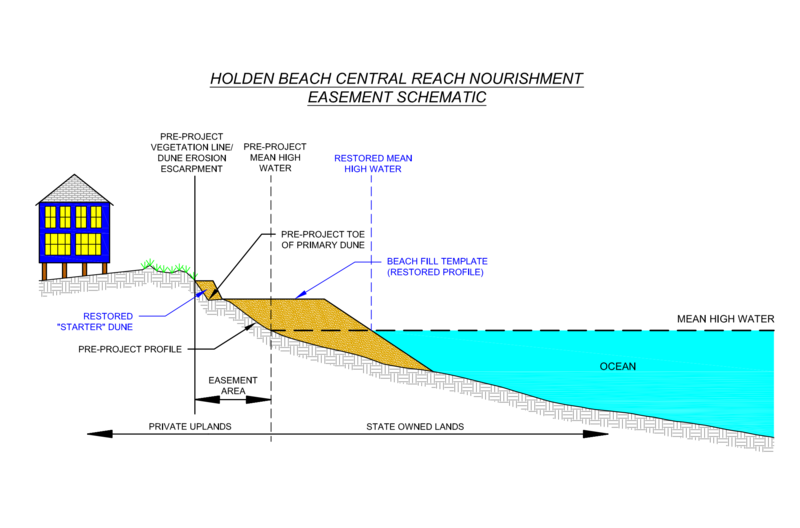 The Central Reach Project is the first major beach nourishment project planned for Holden Beach in many years and the largest to date. 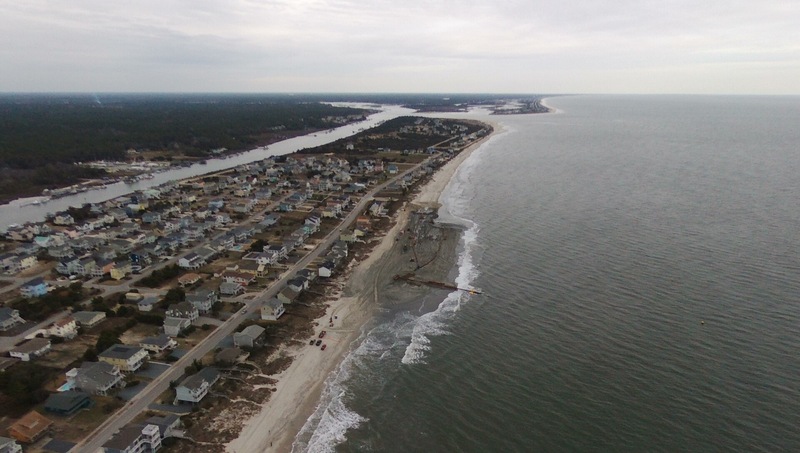 Permits require easements from oceanfront property owners to allow access to their property between the high tide line and the toe of the frontal dune. Will trigger a Static Vegetation Line to replace our current practice of measuring setbacks from the first line of stable vegetation. A Development Line may be applied for in the future. Sand placement is complete as of March 18, 2017. Contractors will finish removing pipe and spreading sand this week. Next up is sand fencing and planting. See our posts here and here for videos and photos while work was underway! Click here for a schedule for the project. Everything is moving forward with the Central Reach Project despite Hurricane Matthew. The project is ready to start on November 16 and will take approximately 120 days in total. As of December 29, sand should start flowing onto the beach on December 30. The Coast Guard has issued the Notice to Mariners about the dredging. The dredge should be offshore November 20 and start dredge plant operations around December 21. There has been a delay due to weather in moving the pipes from Charleston. The barges are too large for the ICWW and will be coming in from offshore. The project should take 60 days of pumping to complete – barring weather, equipment or other delays. Work will be around the clock, 24-7. Anticipate noise and lights at night from heavy equipment. Areas of the strand will be closed for safety reasons as the project progresses. Updates from the Town will be communicated as needed. The town re-bid the project and the winner is Weeks Dredging. Their bid came in at $14,990,000. This bid was approved by the Board of Commissioners at their September meeting. The Board of Commissioners approved issuing the bonds to pay for the project. The loans have closed. The Interlocal agreement with the County is in place. The revised easements have been sent to all property owners and need to be returned ASAP. The Commissioners met August 1 and approved moving forward with the easement condemnation for any easements they have not received. Read more about it here. You can read the Resolution they adopted here. The application to the Local Government Commission (LGC) was submitted September 1, and the LGC acted on it the first week of October. This gives the Town permission to issue the Special Obligation Bonds. This task has been accomplished. The Municipal Service District, which is required for the Special Obligation Bonds, was formed. Note: while the MSD would only cover those ocean-front properties in the project area, the bonds are being financed with the island-wide tax increase that went into effect on July 1. The project is still on schedule to begin November 16, 2016 – which is when “turtle nesting season” is finished for the year. UPDATE: New easements have been mailed. Click here for latest update on the easements. All oceanfront property owners in the impacted area will need to sign easements. The easements are required as part of the permit process (see Item #7 on page 28 of the document). The easements are being mailed via USPS to owners from Town Attorney Noel Fox to the property tax address. If you have not received the revised easement and are in the project area, please contact Town Attorney Noel Fox at (910) 815-0085 or cnfox@craigeandfox.com. The “toe” of the dune is on the oceanward side, the “heel” of the dune is on the street side. The easement must be perpetual to allow construction and repairs in the future. Easements would be required for FEMA funding in the case of a storm. The easements are assignable in case Holden Beach becomes part of a larger organization doing nourishment. The previous nourishments were “loosely administered” and went forward without all easements. That won’t work with this project due to lending issues and the Local Government Commission (LGC). The Town will start condemnation on properties if the easement is not signed. The condemnation vests as soon as it is filed. The Town will be going to the LGC in July (possibly August) and needs all easements in hand at that time, hence the urgency. The urgency is also driven by the need to go to the bond market. Because there were still many questions about the easements the Membership voted unanimously to have the HBPOA hire an attorney to quickly review the easement from a property owner’s point of view. Click here for his assessment. The goal is that this will help expedite the process of property owners signing and returning the easements in a timeframe that won’t impede the schedule for the project. Why is Central Reach Important? This project benefits the whole island, not just oceanfront property owners. By widening the beach in this area the vulnerable sections of the island are better protected from major storms. This has been a concern because there are two former inlets on the island, Mary Inlet and Bacon Inlet, that could be re-cut by a major hurricane – which would wipe out the road, water, sewer and other infrastructure for the rest of the island down from a breach. Numerous studies (read more here and here) have shown a wider beach strand also increases property values for all property owners, including undeveloped lots. For developed lots a half mile from the beach the Pompe and Rhinehart study found that property values increased $254 (in 1995 dollars) per foot of added width. For Central Reach, this would equate to $17,780 based on an average of 70 additional feet of dry sand. Conversely, studies have also shown that a decrease in property value occurs when the beach strand narrows, resulting in diminished property tax revenues and impacts to tourism and real estate sales.